When I made peach lemonade and it turned out good I wanted to to see what other lemonades can be made which is how I came across this recipe for Blueberry Lemonade. Loved the natural color, loved the taste and completely enjoyed the drink. its a definite must tryfor those who like blueberries. 1. 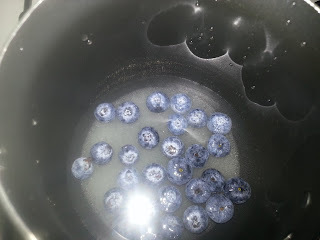 In a saucepan simmer the blueberries, sugar and water. Do not boil. 2. Turn off the flame once the sugar dissolves and the blueberries start oozing out the color. 3. Strain this mixture and keep it aside. 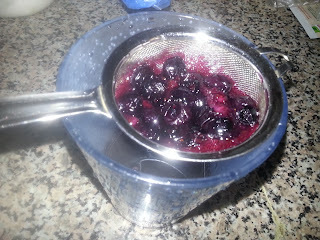 Discard the blueberry skins. 4. once it cools down refrigerate it. 5. Add lemon juice to it as per taste and mix well. 6. To serve add 2 cups of chilled still or sparkling water. 7. 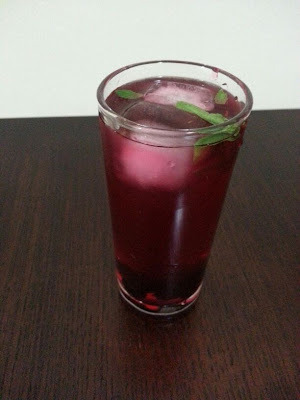 Pour into glasses and add ice cubes, blueberries and mint leaves.